Things have started well for Chelsea boss Maurizio Sarri this season, as the Italian tactician looks to oversee a successful first year in charge at Stamford Bridge. The Blues sit just two points adrift of Premier League leaders Man City and Liverpool, while they defeated the latter in their League Cup clash last month to keep hopes alive of winning silverware. 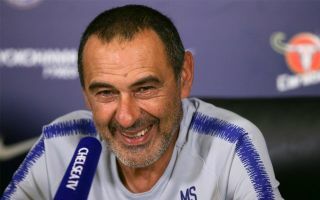 Given Sarri arrived so late in the summer, it’s impressive to see the improvement made in such a short space of time particularly given that the former Napoli boss has brought a completely different style of play to the team compared to that seen with Antonio Conte last season. While it remains to be seen what he can achieve having had just one transfer window to stamp his mark on the squad, with Jorginho in particular proving to be a fundamental addition in the heart of the side, time will tell how much better this Chelsea side can get under Sarri when he continues to add his own players. Speculation continues to suggest that there will be activity next year, and here are three ins and outs that could potentially continue the process of transforming Chelsea into a real threat both domestically and in Europe moving forward. As noted by Calciomercato, both Rugani and Piatek are on the radar for Chelsea, potentially to bolster Sarri’s options at either end of the pitch. Piatek, 23, has enjoyed a stunning start to life in Italy with 12 goals in seven games, and given his characteristics in being able to play as the lone striker for Genoa, he could be an effective solution to establish himself as a consistent source of goals to produce where Morata and Olivier Giroud have failed. In addition, with Mateo Kovacic’s loan spell set to end in the summer, in the event that a permanent switch isn’t agreed upon, a swoop for possible free agent Adrien Rabiot, as suggested by the Daily Mail, could be a viable solution in that department. The 23-year-old would add a lot of technical quality and creative class in possession, fitting in with what Sarri wants from his side from a style of play perspective, and so that could be a wise addition too. In terms of those potentially leaving, Cahill and Drinkwater will seemingly struggle to earn a more prominent role, while the former will also turn 33 in December and so signing Rugani could be seen as a sensible replacement for the long term. As for Morata, the Spaniard has managed just two goals in 10 games so far this season as his struggles in England look set to continue. If the 25-year-old can’t turn things around in the coming months, Chelsea have to bring in a more prolific forward otherwise it could really end up costing them having to rely on the likes of Eden Hazard and Pedro to get the goals all season.